“We’re seeing Bitcoin ($BTC) conversation volume alone exceeding that of the FANG stocks (Facebook $FB, Apple $AAPL, Netflix $NFLX, Google $GOOG) on a daily basis. Jared Podnos, Head of Global Financial Data Partnerships at Twitter, stated that cryptocurrency conversation on Twitter have grown at an unprecedented rate. He did not provide any hard numbers to show the number of tweets or the percentage growth, but he did provide a chart which clearly indicates there is some correlation between price and tweet volumes, although which one is causing which is not very clear. 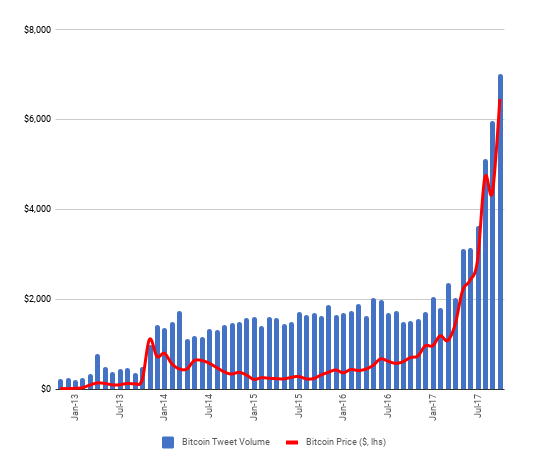 Bitcoin’s tweet volume and price correlation. Bitcoin has seen astonishing growth, rising nearly 100x since last year, up from a bottom of around $150 to a current price of $7,500. The asset has gained a market cap of $125 billion, with its trading volumes standing at $4 billion, while its price is nearing all-time high again. 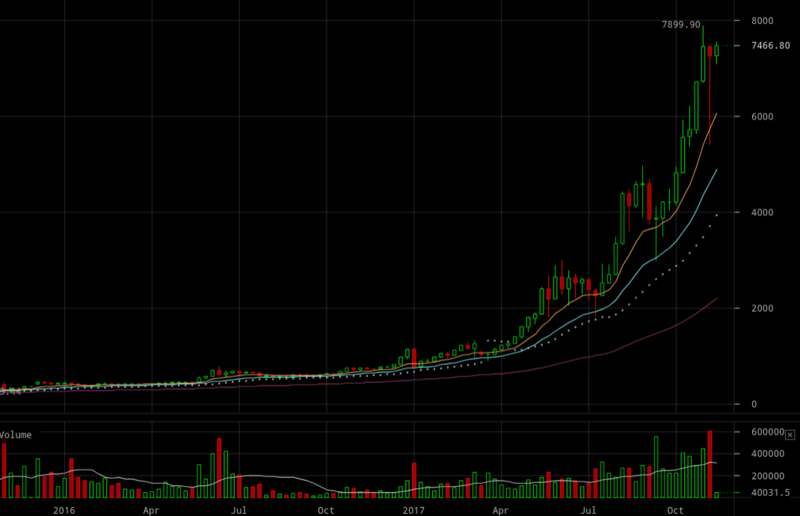 Bitcoin’s price action for this year. On top, bitcoin has had a number of forks this year which gave all bitcoin holders an equal number of fork coins, with the most prominent one being Bitcoin Cash, a currency that is currently valued at more than $1,000. The two combined have a market cap of almost $150 billion, with trading volumes of some $6 billion, making their investors some stupendous gains. That’s in part because bitcoin went mainstream this year as the tweeter figures shown, with the asset at times a topic of national debate as it continues to rise to great new heights.